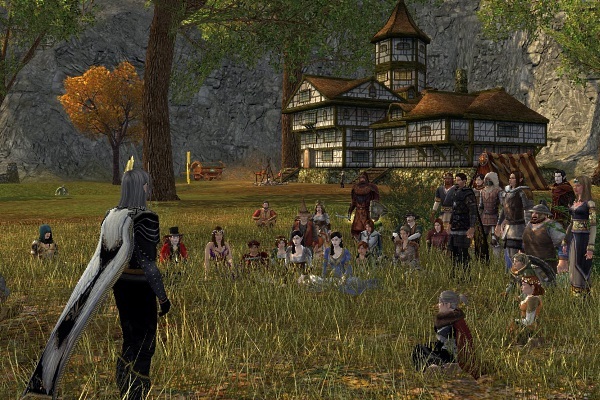 Stories were told, poems were recited, and songs were sung at the first annual Storyteller’s Festival. 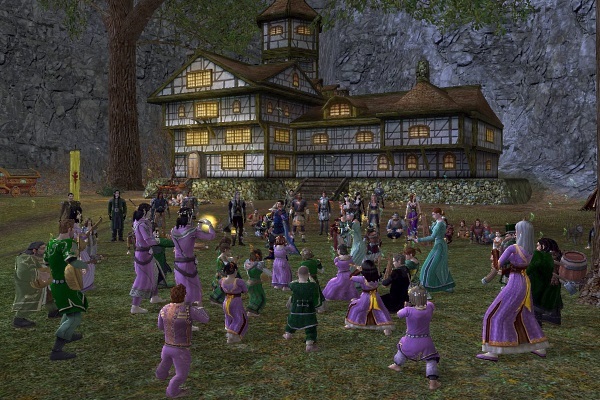 The event began with a concert by The Starlight Orchestra performing the Fellowship of the Ring Symphony. Under the direction of Lilikate, this twenty-four-member orchestra plays beautiful pieces that are simply lacking when attempted by smaller bands. The audience grew quickly as word spread about the quality of their performance. While the audience enjoyed the music, thirteen artists made their way around the neighborhood, finding the perfect spot at which to present their contest entry. Ballads were sung by Baudhaegas, Erikin, Navrian, and Tennyson. 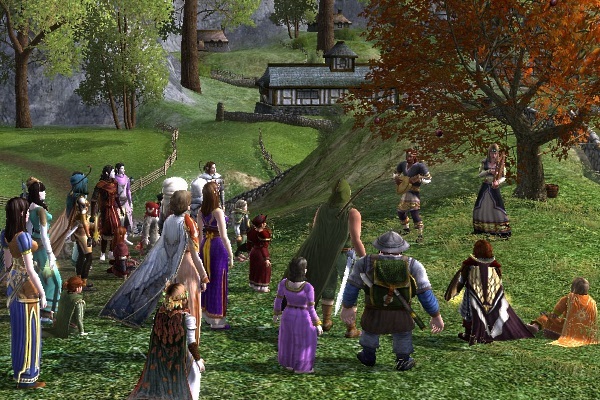 Poems were recited by Byrcha and Winri. 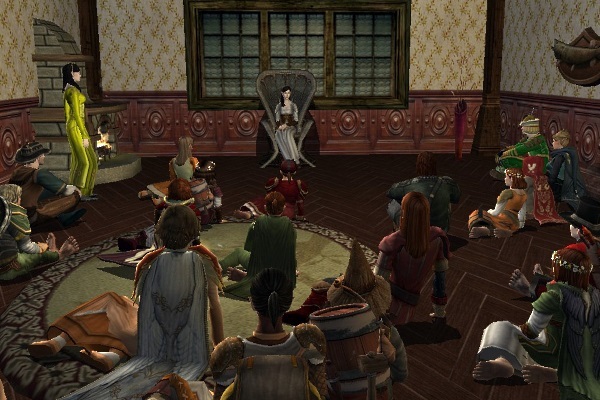 Short stories were told by Acornee, Berynon, Cressley, Viyoley, and Winri. A story and a poem were shared by Fayeh and Rhovanael. The artists were dressed in an array of stunning and delightful outfits. They spun tales of lost love, haunting ghosts, obsession, the One Ring, an ill-fated expedition to Moria, and other topics with a spooky or Autumn theme. Some of the performances brought the audience to tears while others inspired a great roar of applause. As the last story drew to a close, the audience returned to Windy Acres Ranch. Kiralynn invited the performers from each category on stage for a vote. The audience was encouraged to donate money to Rick Heaton’s “Extra Life” campaign, benefiting Children’s Miracle Network Hospitals. Click here to see the list of donations. If we have inspired you to help, please click here to donate and be a real-life hero. Feel free to mention the Storyteller’s Festival in the comments. After all the votes were tallied, it was time to announce the winners. The voting was very close. In one case, an artist took the lead by only two votes. The artists earned extra votes by raising money for charity. 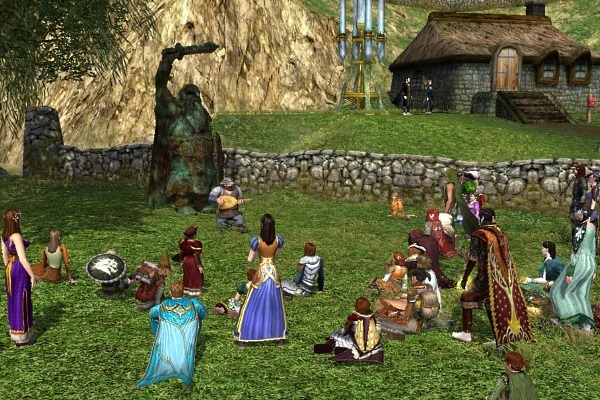 In the Best Ballad category, the winners were Tennyson in first place, Baudhaegas in second, and Erikin in third. In the Best Poem category, the winners were Rhovanael in first place, Byrcha in second, and Fayeh in third. In the Best Short Story category, the winners were Acornee in first place, Cressley in second, and Rhovanael in third. The first place winners received a grand prize of 3,000 Turbine Points. Second place winners received 1,500 Turbine Points, and third place winners were given codes for 1,000 Turbine Points. At the end of the evening, $388 were raised for charity. Thank you to everyone who attended, especially our performing artists. Many thanks to The Starlight Orchestra for an amazing and memorable concert. Special thanks to the heroes who donated to Extra Life – Alison Morgan, Anonymous, Claire Balani, Clifford Kutzner, Eric Nail, Henrietta N., Jane Haspel, Jay Schlegel, Marja Kerkola, Peter Spanos, Sara Stallard, and Tobias Hasselwander. Your generous act of kindness will be remembered!